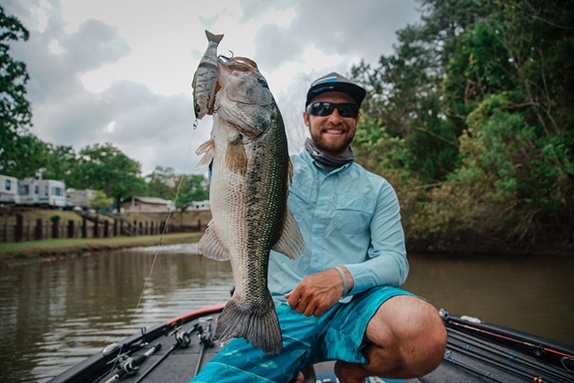 When he wants to find out what caliber of bass truly live in a given fishery, Brandon Palaniuk likes to use jumbo-sized swimbaits as his search tool. 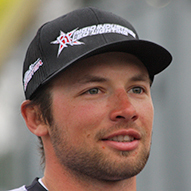 He started fishing big baits during his early teens back home in Idaho. He marveled at the hometown lure designers who were a part of the initial swimbait craze, but he’d also studied the California swimbait scene for years. Now, it’s evolved from baits being pieced together in garages to those commercially produced, some of which command up to $1,000 each. Initially, Palaniuk started fishing boot-tail soft plastic swimbaits measuring up to 7 inches long. From there, he progressed to fishing larger baits with the allure of catching bigger bass. “When I saw 12-inch bass attack a 6-inch swimbait, the wheels started turning,” he said. Soon after, Palaniuk progressed to fishing 8- and 9-inch baits, eventually making the jump to the 12-inch Roman Made Mothers. Any time that gizzard shad are in play, that’s his first cue that a big swimbait could pay big dividends. He pointed to Lake Guntersville, its healthy population of 4-pound plus largemouth and their penchant for chomping on gizzard shad. For a bass to eat a 6-inch bait versus a 9-inch version, Palaniuk reasoned, it’s exerting the same amount of energy to attack, but doesn't get much of a meal. Time and again, he’s witnessed largemouth so entranced by a larger bait that they’ll swim right into his trolling motor. Equally fascinating is witnessing a bass that suddenly realizes it has left its comfort zone and not sure how it got there. Palaniuk is quick to point out that every bass is different, and each has its own personality and behavior pattern when a big bait swims by. Getting a glide bait to do a 180-degree turn – one or two turns of the reel handle will cause the bait to turn quickly, then stall – can be the trigger point for a bass to bite. “When it stops, that’s when they’ll eat it because that is their opportunity,” he added. When bass track a swimbait from a longer distance, he’ll get creative by imparting a couple of quick twitches to see if they come forward or rise up toward the bait. If nothing happens, he’ll slow it way down. “When those fish are hot and heavy and following the action of the bait, I’m going to try to get that back to spin around and look them in the face,” he said. Alternatively, an 8-inch Huddleston (a soft plastic bait) should be slowly reeled along, depending on the cover that it needs to hover above. Anglers should envision the tail wagging side-to-side ever so slightly. Going from an 8-inch bait to a 12-inch version comes with sacrifices, though. It’s likely the number of bites will drop off by two-thirds, but you’re targeting the true alphas of the bass in a given lake. When throwing a large bait, like a Huddleston, Palaniuk allows a slight delay before swinging hard on the fish since it is literally a heavy soft-plastic bait molded around a jig hook. 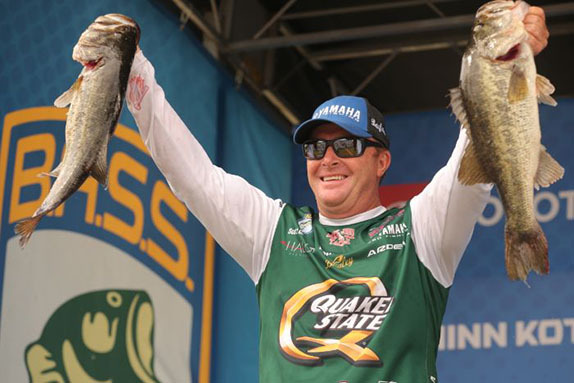 When throwing a glide bait, typically outfitted with treble hooks, since the bite will be visual, it’s more important to train your body to feel the pressure first, he says. 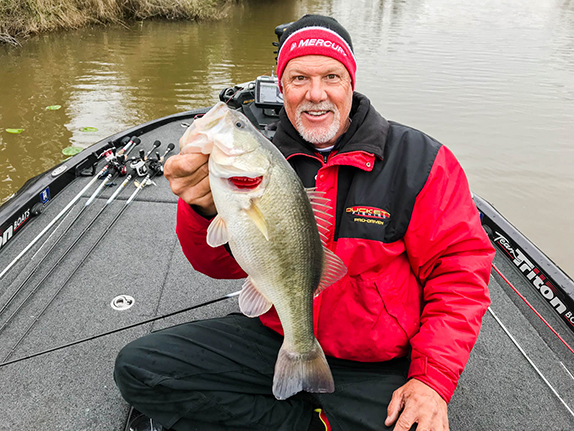 “You’re still hitting them pretty hard since you have a big bait and big hooks, but it is not as fast of a hookset compared to the Huddleston,” he said. Controlling the handle of your casting reel is key since it allows the angler to turn the bait 180-degrees, take up the slack on a vicious bite, and work their rod with the proper cadence and keep your body in position to set the hook. With soft-plastic swimbaits, like the Huddleston or line-through baits, he’ll boil them in water for up to 20 seconds for smaller baits and 30 seconds for larger baits. Without a straight tail, a swimbait will never swim perfectly straight, vertical or natural. Once removed from the water, he hangs them vertically to ensure that their tails remain straight as the bait dries. If limited to just one rod and reel combo, Palaniuk would opt for a heavy action 8-foot glide bait rod with a parabolic action to control the fish, but at the same time a forgiving blank to absorb the power of a fish should it jump or surge at the side of the boat or start thrashing. He prefers the 7-foot, 9-inch Alpha Angler A-Glide, a heavy-action rod recently introduced at the 2019 Bassmaster Classic. The Daiwa Tatula 150, spooled with 25-pound Seaguar Tatsu fluorocarbon, line is his first choice when he needs his bait to dive, but he'll opt for 25- to 30-pound monofilament to keep it higher in the water column. For Huddlestons and other big soft-plastic baits, an extra-heavy action rod provides the necessary backbone to drive the hook home. For a line-through swimbait rod, a lighter action rod paired with a Daiwa Tatula 150 spooled with 15- to 20-pound Tatsu excels. The wider spool and 100mm handle afford Palaniuk the necessary torque to reel down on a fish and get it back to the boat. Palaniuk has helped develop a new addition to the glide bait arsenal. The Storm Arashi Glide is a 7 1/2-inch jointed hard-plastic bait that supersedes his other favorites going forward. It is due to be unveiled at ICAST this summer. > Huddleston ROF 5: Rest on bottom at five feet on a 10 count; excels in colder water in the early spring. > Huddleston ROF12: Rest on bottom at 12 feet on 10 count; another good early spring option. > Deps Slide Swimmer 250: Once the water warms, a glide bait can be more powerful because fish become more active and this bait offers a different action. > Roman Made Mother and HinkleTrout: Because they’re fun to fish with. > Working Class Zero Battles Shad: Perfect when worked around vegetation since it is weedless.